Successfully Added Car DVD "Piranha" - 7 Inch Detachable Touch Screen, GPS, Analog TV (1DIN) to your Shopping Cart. 1DIN (50 mm high) Car DVD Player with a 7 inch detachable touchscreen! Running today's hottest GPS maps, it comes with all the features you need to transform your car into an entertainment zone, such as Bluetooth, Analog TV, and more. Why do you need a 7 inch touchscreen? For a bigger, brighter, and better viewing experience. For maximum enjoyment of your DVDs and downloaded media such as movies and TV shows. Why do you need a detachable 7 inch touchscreen? Because a detachable front panel offers the best protection against car break-ins. When you leave your car, just eject the front panel and take it with you. So this car DVD player has GPS? Yes, this 7 Inch detachable touchscreen car DVD player features the WIN CE 5.0 operating system which is your guarantee that it is compatible with today's most popular GPS maps. Get the “Piranha” car DVD player and you get access to a world of cutting edge GPS features like: lane assist, voice guidance, 3-D views, intelligent route of planning, and points interest (POI). In the world of car customization and automobile audiophiles, the one-DIN standard is the preferred form factor because of it saves you in-dash space. 1-DIN units are only 50 mm high whereas 2-DIN units are 100 mm high. The beauty of the “Piranha” is that it incorporates a 1-DIN 50 mm high backend with a 7 Inch screen (usually associated with 2-DIN models) so you get the best of both worlds - space savings AND a bigger display! Order yours today and we'll ship out this first class car DVD player first thing tomorrow. 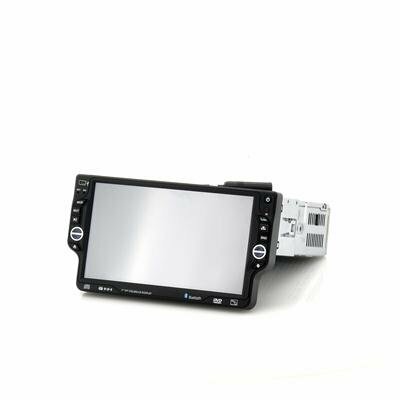 Brought to you by the leader in wholesale 1DIN Car DVD Players - Chinavasion. Muy recomendado, super rápido en 3 días, disfrute de la compra. Bien embalado. Todo lo demas ok ok.
very good tool for the car has everything is perfectly.